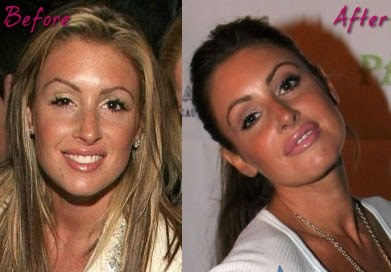 Rachel Uchitel before and after lip injections. Here we see nightclub manager/hostess turned media hound, Rachel Uchitel, after text messages revealed her as Tiger Woods' mistresses number one. Ever since Ms. Uchitel grabbed the media spotlight, there has been suspicion regarding her possible plastic surgery enhancements, including such procedures as breast implants, nose job, botox and lip injections, which is what we'll be covering today. A few of her alleged operations are 50/50 tossups, such as the nose job, however her overly done trout pout lip injections seem quite evident from the above before and after photo. Also stay tuned for some side by side comparisons of her other suspected plastic surgery procedures.